Astro Garden is the latest Facebook game from 6 Waves Lolapps, and imagine it is about farming, but not only, build your garden, start your research on the elixir of eternal youth! It’s time to start to build an imaginary garden on Facebook! 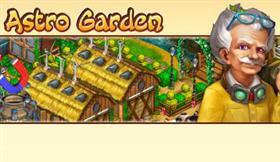 Build fanny houses, feed pig with zebra pattern, and research on the elixir of eternal youth! Astro Garden gameplay is great, you start the game with an indication to start chopping trees, in what seems just another ordinary farming game, but soon enough you will be surprised by a thunderstorm that destroys and turn everything to ruins. This includes your memory that will have to be restored by completing various achievements, represented by a storyline that will guide you through the game. 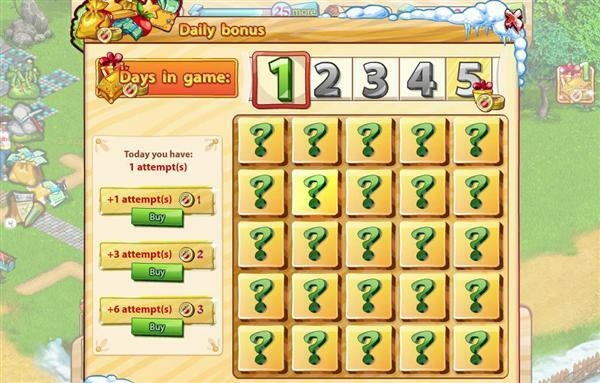 With great colorful graphics and near to perfect gameplay mechanics, Astro Garden gives the player a great sensation of progression, while most of the gameplay is already familiar to most Facebook farming players, you have to clear the terrain by chopping down trees, and smashing rocks, plant crops and place various types of buildings, Astro Garden has a fews surprises in the sleeve, that manage to break the monotony and spice the game up, like wolves that come out of the woods when you are clearing the land, or strange looking chickens that have to be fed and eventually sold. 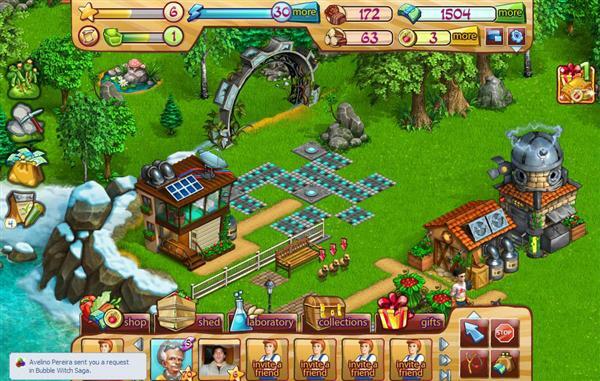 Astro Garden is played in a futuristic environment, which is noticeable in the several nice looking buildings, and in the other game mechanics available, and this is where it manages to separate from the flock of the other farming games, introducing a technology tree, available in the laboratory, where you can research new technologies and produce the most strange and original items, from strawberry Volcano Seeds to animal combinations like the Leopard Chicken or the Tiger Calf. 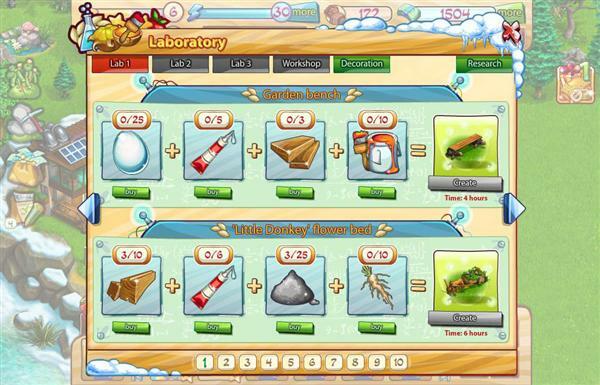 You can have up to 3 Laboratories, 1 Workshop and you can even create your own decoration items. Definitely a game to try! 1) How can I feed the cat?Click on the kitty and select ‘Ask from a friend’ or ‘Buy for 5 golds’. 2) Where can I get sour cream? 3) How can I ask a little sour cream? 4) How can I remove the cat? The cat cannot be removed. 5) How can I put cows in the chickenhouse/chickens in the cowshed? 6) How can I place cows in storage? 7) How can I add friends? I know my friends are in game but I can’t see them. What shall I do? Press ‘Call friend’ button in the bottom left corner, select ‘Invite neighbors’ or press ‘Accept’ button if it is there. If you see ‘0’ in ‘Invite’ and ‘Call Friend’ tabs, there is no information available on your friends so you can’t add them. If that is the case, contact out tech support service. 8) What should I do to open extensions 1, 2, 3…? New extensions open when you have passed another extension quest. 9) When will the wedding take place? How can I get married? The wedding will take place after you carry out a series of wedding quests. 10) How can I send a gift? Click the ‘Gifts’ tab, then click ‘Send’ in the upper left corner. 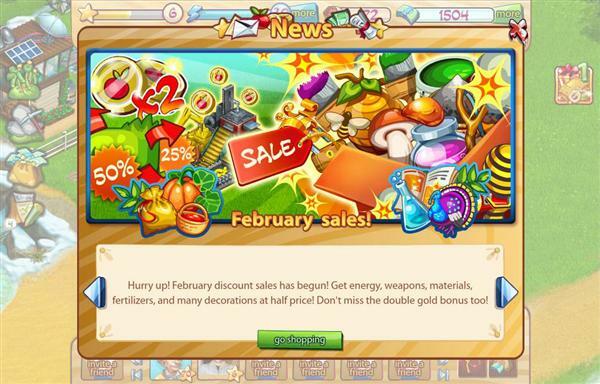 Choose a gift, then check ‘Show players searching’ and press the ‘Turn off message’ button. Now you can simply click on your friends, so your gifts will be sent automatically. 11) How can I get a certain gift? In order to get a specified gift, such as, for example, a little engine, glass or energy, you should go Gifts -> Send and click on the magnifier icon with a ‘+’ mark. The subject will be added to your list of wishes, and your friends will see it. 12) What will my neighbor get if I press ‘Say Thank You’? By pressing ‘Say Thank You’, you send your neighbor the gift you are thanking him/her for. When you do work at your own or your neighbor’s farm, you see awards dropping out, which are termed ‘drop’. While collecting the drop, you will see your combo level changing in the scale right under the energy indicator. 14) How should I collect combo? 15) Why do I need comfort? In order to do research in the lab, you should have different levels of comfort. 16) How can I boost comfort? You can boost comfort by fixing decorations at your farm. 17) When can I access Magnetto, Teslagenerator, Ionizer, etc.? 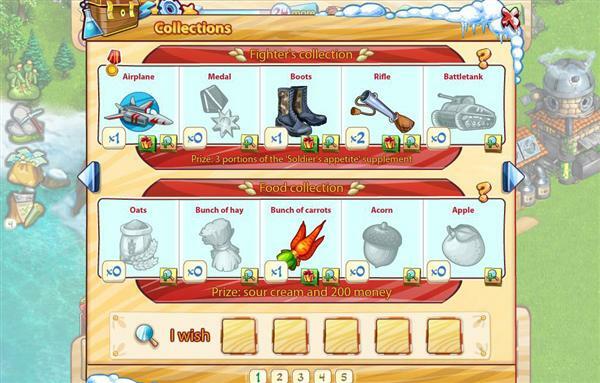 You can access these items when you have completed the required quest. 18) Where can I get nails, lobsters, flowers, etc.? You can get all these things from your friends as presents. Open the quest requiring these items. 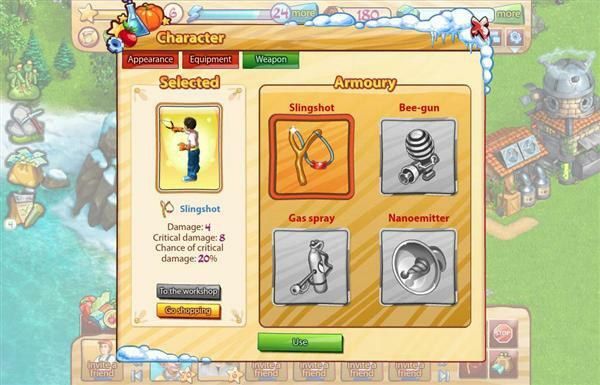 To ask a friend to give you an item, press ‘Ask’ button and select a neighbor from the drop-down list. Also, you can earn these things by doing work at your own farm. 19) Where can I get a hiking blanket? It will appear in your storage after completion of the respective quest. 20) I purchased nano-forest/nano-stones, but there was no space, so the forest/stones disappeared. Where did they go? If you don’t have enough room for nano-forest or nano-stones at your farm, they will go to storage, so you can find them via the ‘MISCELLANEOUS’ tab. 21) How can I move tiles? Click on the blue arrow in the bottom right corner. Select the right option in the bar, move the mouse over the tile you need, then click on it and carry out the action. 22) I bought segway, but I couldn’t find it in storage. Where did it go? Click on your character, then go -> Appearance->Outfits->Segway->Apply. 23) I bought a segway, but it disappeared after a few hours. To buy a segway and use it constantly, you should pay 45 golds. Also, you can pay 3,000 game bucks and lease one for 24 hours. If your segway is gone, it means that the lease term has expired. 24) How should I use the lab? 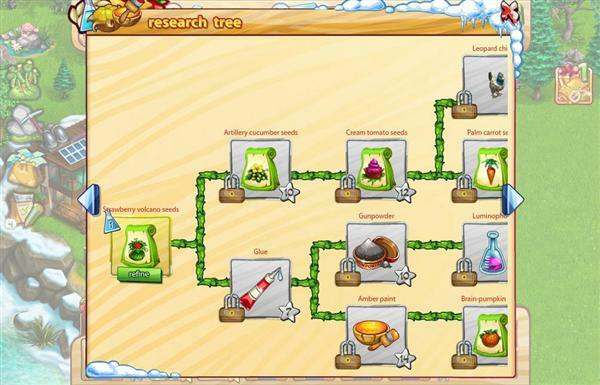 The lab is intended for research work aimed at creating hybrid seeds, animals, materials, weapons and decorations. 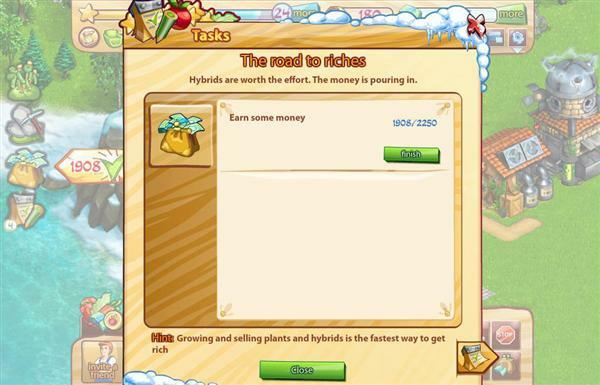 To create hybrid seeds, material or animal, you should conduct a research first. Click ‘Lab’ in the top right corner, then press ‘Research’ and specify research type. Then click ‘Study’. In the popup window, you will see a list of items required for research. Ingredients, which you have not obtained yet, are marked in gray. If you see one, move the mouse over it and read the prompt. For example, if you have fully researched Strawberry Volcano seeds, you can start producing them in the lab. 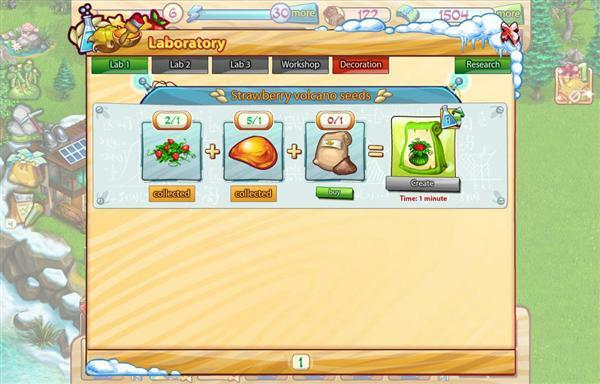 Open the ‘Lab’ tab and select ‘Strawberry Volcano seeds’. If all the ingredients are there, press Create. If some ingredient is missing, move the mouse over its icon, read the prompt and follow it. 25) I wonder why I can’t study the Leopard Chicken. I have read that I need four artillery cucumbers to do that, and I have twenty cucumbers in storage. 26) What should I do if there are no quests available? You must have completed all the quests available. Next time we update the game, new quests will be added. 27) How can I get the cake?The cake is available for birthday persons only. If you deliberately change your date of birth in your account to get it earlier, you will never get it! Related Tags: 6Waves, farming, Gameplay, simulation.